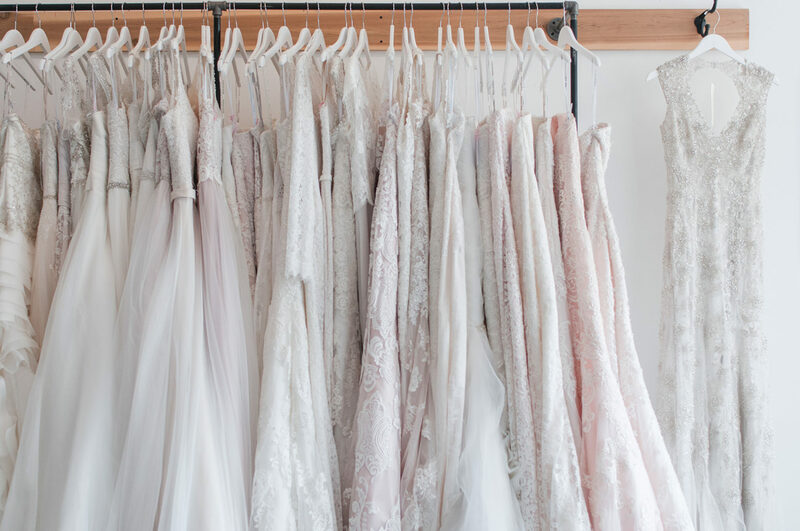 The Savvy Bride is a unique Bridal Boutique that sells sample designer wedding gowns straight off-the-rack. Our prices range are up to 50% off retail prices and are all under $1999! We carry sizes ranging 0-22 (bridal sizes 6-26). "Normal" bridal boutiques throughout the country buy sample wedding dresses each season to showcase in their stores. Once the season ends, some of these sample dresses become discontinued by the designer and get replaced with new and current ones to show. That's where we come in! As soon as they are taken off the showroom floors, The Savvy Bride grabs them and sells them at a fraction of the price! All of our dresses are under $1999 and are up to 50% off of the retail price. We carry sizes 0-22 (bridal sizes 6-26) and are inventory is continually changing. Designer we carry include Maggie Sottero, Sottero and Midgley, Jasmine, Allure, Hayley Paige and more! Not only are we focused on not breaking the bank for a dress but we are also focused on our brides having a great experience! That is why we only have one bride at a time in the boutique. It's like a brides own private shopping experience where you can relax and have fun feeling like a princess! The bride can try on as many gowns as she likes and can roam around the boutique looking through the selection without bumping into other brides. We try to make it as an enjoyable as possible because we know that there is a lot of stress when it comes to weddings. Shopping for a gown should not be one of them! If you want a gorgeous designer dress but don't want to pay a lot of money, then make an appointment today! "I would highly recommend The Savvy Bride. It is an adorable shop and its owner, Erica, was extremely personable and pleasant to work with. She has a nice variety of dresses and is constantly getting new ones in." "Go here! It was Great! It was this cute little place with such a personal touch. Erica was amazing and super sweet and helpful. The dresses were super reasonably priced and she had a great selection of dresses including plus size! I tried on 6 dresses and then found the one! She let me take my time and was very helpful with pictures, angles and suggestions. I bought my dress here and would highly recommend giving it a try! 10/10 would go again!" "There was an amazing selection of gowns, I only went to see sizing and styles but I found the perfect gown for me! Service was amazing, attentive and understanding of all concerns I had about size and fit, as well as styles that I might like or not like"